I have an obsessive personality, I admit. I’ll binge watch TV shows, speed-read dystopian teen novel series and spend hours googling the heck out of things like different dumpling doughs. And although I find these things immensely interesting and immersive, I can kind of understand how it makes conversation a little hard at times. Me: OMG! Molly made a fried steamed bun with bacon and eggs inside! Can you imagine how awesome that would taste? Me: She is such a genius! Me: Molly. You know, my name is yeh? Molly. Me: (finally getting that he’s completely uninterested in the awesomeness of bacon and egg sheng jian-baos) Um, anyway, isn’t it crazy about all those fires in San Diego!? Actually, even though Mike doesn’t know any bloggers out there, he’s pretty awesome when it comes to thinking up recipe ideas. 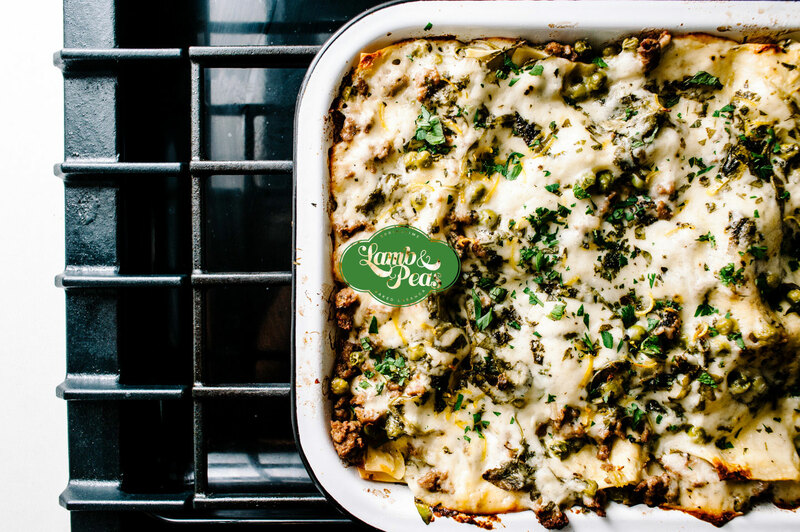 It’s kind of rare, but when it does happen things like this lamb and pea lasagna come about! We were just having a good old chat about lasagna in general when he thought of using ground lamb instead of the usual ground beef or pork. 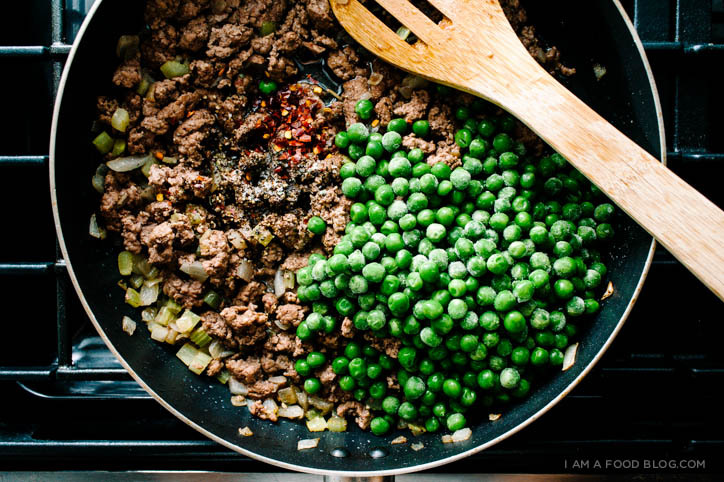 I totally ran with the ground lamb idea and immediately thought peas because I love lamb and peas together. And when I think of peas I think of mint, so that had to make an appearance too. The arugula was added for a bit of bite and the lemon zest brought the freshness. It’s a whole mess of flavours that tasted really, really good together and reminded me of spring. 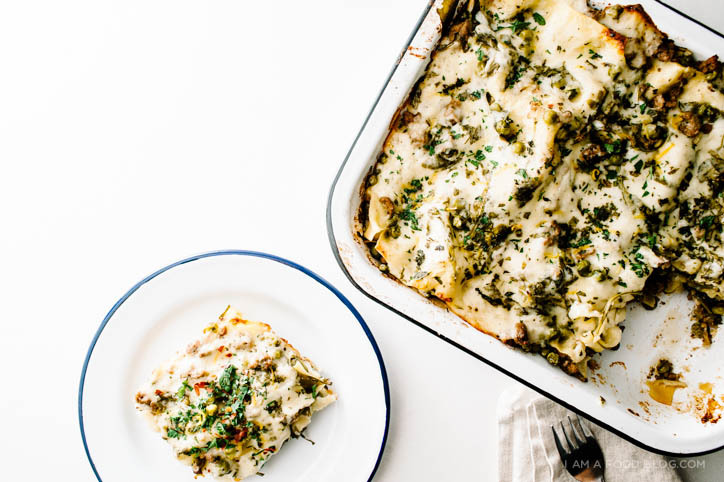 Lasagna can seem like a bit of work (it is!) but I totally think it’s worth it. I decided to go with no-boil noodles this time around and I was pleasantly surprised. I think i’ll stick with regular boil noodles next time around, but for those times when you’re in a hurry, no-boil is definitely the way to go. 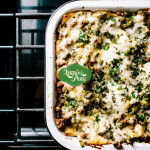 i am cheesy, i am peasy: i am lamb and pea lasagna! Make your lamb sauce: Add a touch of oil to a large skillet and cook onions and celery over medium high heat until soft and translucent. Add the red pepper and stir. Add the lamb and cook, breaking into pieces and cooking until deeply browned. If there’s an excessive amount of fat rendered out, remove from the pan before adding in the peas and chicken broth. Simmer over low heat until stock is slightly reduced, about 5 minutes. Season with salt and pepper to taste, remove from the heat and set aside. Make your cheese sauce: Over medium heat, melt the butter. Add the flour and stir constantly over medium heat for about three minutes, until smooth. Pour in half of the milk in a thin stream while whisking. When smooth, add the rest of the milk. Keep on medium heat and stir for about 10 minutes, until the sauce thickens. Stir in the cheeses and season with salt and pepper to taste. 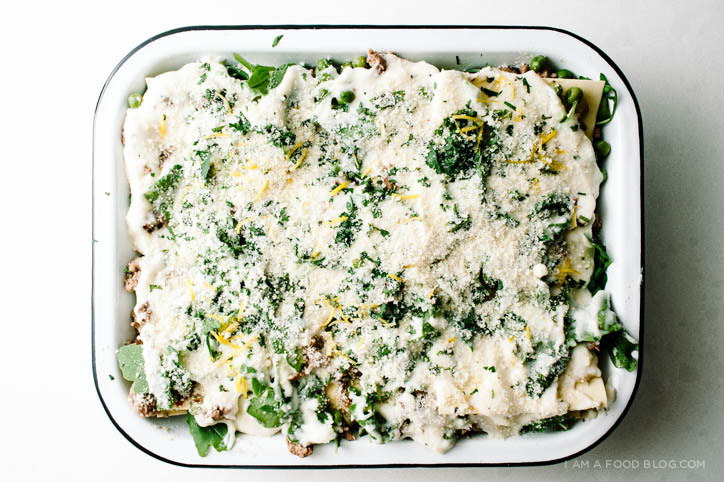 Assemble your lasagna: In an oven-proof casserole dish (I used a 13 x 11 inch), spread out a generous amount of the lamb mixture, top with a layer of no-bake lasagna noodles (break the noodles to fit if needed), then cheese sauce. Sprinkle with flat leaf parsley, mint, arugula and lemon zest. Repeat until you have used up all of the noodles, sauce and cheese, ending with a cheese layer. Sprinkle on a bit of parmesan and bake, covered tightly with tinfoil for 40 minutes, then uncovered at 375°F for 15 minutes. Let stand for 5-10 minutes and enjoy! 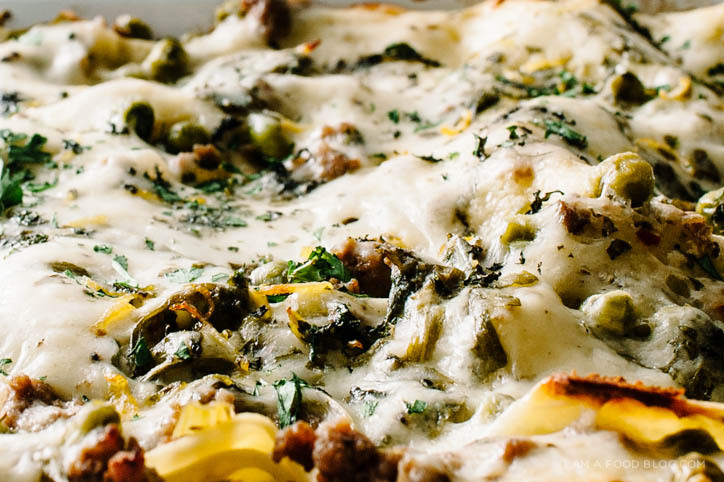 Note: You can certainly use regular lasagna noodles. 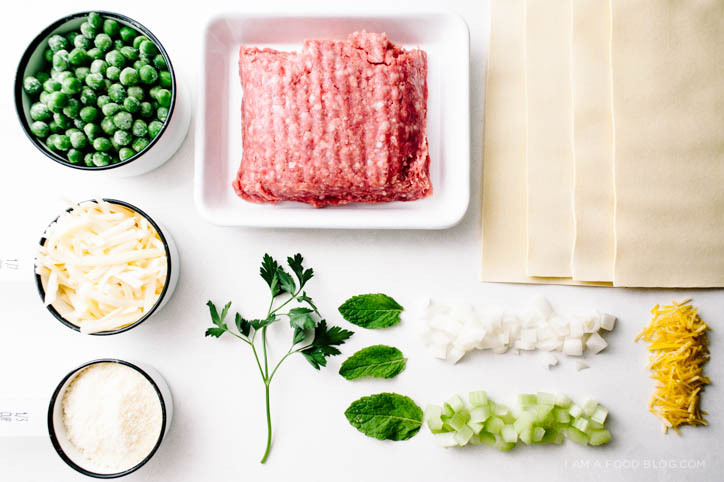 Make sure to skip out on adding the broth to the lamb filling and bake the lasagna uncovered at 375°F for 30 minutes or until cheese is browned and crispy. uhm – just wondering: is the ‘lasanga’ a typo on purpose because then i’m missing the clue :) looks divine in any way! A lot of layers, a lot of falvours. Nice recipe! I doubled the recipe when I made this (large family, need leftovers) and did not use no-boil lasagna sheets. The flavor combination was great, but it was swimming in liquid and thus didn’t have the same visual appeal… Moral: cut down on the liquid when using regular lasagna? Or scaling up? YES! There’s definitely extra liquid for the no-boil noodles. Skip out on adding the broth in the lamb filling and don’t cover when baking. This looks amazing!! First time at your blog and am loving it! Side note–do you have an easy way to print recipes from your website? I can’t seem to find it as an option. Thanks! The easiest way would be to just copy and paste the text into a word processor, change the font colour and print from there. Hope that helps! I made this last night – it was great! It was a little dry, but I think that may be because I didn’t really add any of the liquid that cooked down with the meat. I also managed to pick up a bag of shredded pepper jack instead of mozzarella. It def gave it an extra kick. Delicious recipe! You really nailed it with this recipe. Phenomenal. It’s amazing how something so rich can at the same time taste really bright, fresh, and interesting. Gorgeous flavor combo. I’ve now made this twice to your specifications and once as a lazy deconstructed version (when I couldn’t wait to bake a lasagne on a weeknight –we just made normal pasta and cooked the broth off a bit and cooked the peas through), and I’ve passed the recipe on to a ton of people. Are you using frozen peas? Yes, I used frozen peas. This looks awesome! I think it’s my–really nyc? chilly rain again?–destiny. Hello, this is a question about the steps…says “Add the red pepper and stir. Add the lamb and cook, breaking into pieces and cooking until deeply browned. If there’s an excessive amount of fat rendered out, remove from the pan before adding in the peas, red pepper flakes” so when should the red pepper flakes be added? i think it’s a pretty fun dish to serve at a dinner party!